The Toledo Symphony League is now in its 66th year of service to the Toledo Symphony Orchestra. The League supports the Symphony, its musicians and fosters students of orchestral instruments through fundraising by awarding monies, scholarships, and bestowing summer study grants. League members volunteer their time and talents and have fun doing it. Providing transportation for Guest Artists. League members support the musicians not only by attendance at TSO concerts but also by providing Musician’s Survival Bags stuffed with essentials and goodies for each of the 70 musicians. In addition, the League also supports the continuing education of TSO musicians by funding Summer Study Grants that allow musicians to pursue training in music education. Hosts receptions for student musicians, their families which include the Showcase of Young Talent Concert, Community Music Lessons and the Toledo Symphony Youth Orchestra Concert. Provides ushers for the Young People’s Concerts. 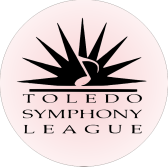 As a fund-raising arm of the Toledo Symphony, the Toledo Symphony League has contributed to the Toledo Symphony Orchestra since our inception. In the last ten years alone, the League has donated over $250,000. Our fundraising is primarily accomplished by planning and hosting social events. Be it our Holiday Market, Rite of Spring, Tune in Tuesdays, Leaguers Who Lunch or Parties of Note, the League has a lot of fun fundraising!